The following documentation is for WooCommerce DYMO Print Product add-on version 5.0 which is released in December 2018. 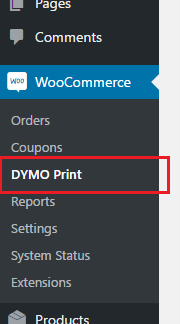 WooCommerce DYMO Print Product add-on is an extension to our popular WooCommerce DYMO Print plugin. WooCommerce DYMO Print Product add-on needs to be purchased separately. This plugin let’s you print product labels on your DYMO LabelWriter. It will not work without WooCommerce DYMO Print. Make sure WooCommerce and WooCommerce DYMO Print are installed. This plugin is an extension for WooCommerce DYMO Print. It will give you the possibility to add product labels. Before you can print product labels it’s important to configure the plugin correctly. Go to the “General settings” and add a new label with “label type = Product”. You can create your own labels in DYMO Label Software. You can do this in the same way as you create order labels. For a step-by-step instruction read the following article about creating labels. Now you’ve added your new product label and create a new .label-file with DYMO Label Software it’s time to upload the label to the plugin. Go to the new label by clicking on the tab. Go to “Step 1: DYMO .label file” and select the file at “Upload new .label file”. Click button “Save Product label layout” to upload and save the product label layout. After you have choosen your label, you need to configure it. You need to assign WooCommerce product data to label objects (fields). Read more about label configuration in this article. Shows all product metadata. There must be at least one product to show product metadata. Shows all product variation metadata (since version 3.0.6) when available. Note: If a product variation has specific product variation metadata this will be printed. If the object returns empty for product variation metadata it will try to receive product metadata for that variation. There is also a setting added called “Print labels based on stock”. By changing this setting you can define if the product stock is used to print labels. Yes: Use the stock quantity to print labels. For example: if your stock quanity is 6, print 6 labels. No: Ignore stock quantity. Print one label for each product. You can bulk print labels from the product overview. Yes – Product parent label: Print label for the parent product. Variations will be ignored. Yes – Variations labels: Print label for each variation. If a product contains 6 variations, print 6 labels. No: Skip all variable products during bulk printing. Choose which LabelWriter you want to use for this type of label. All connected LabelWriters are listed. From the product overview page you’re able to select multiple products and print labels for them in bulk. Please note: The number of labels is depending of the setting “Print labels based on stock” and of the setting “Bulk print variable products” (see above at step 2). If you’ve selected “No” at “Bulk print variable products” the products are skipped automatically. Follow these steps to print products in bulk. From the product detail page you can print labels. From the product detail page you can also print labels for variable products. You can print multiple labels from the same product in a single click with Label combinations. You need to have at least two product labels to make a combination. You need to create a new label combination. Set the order of printing by entering a number, where the lowest number is printed first. Now you can print two label types with a single click. The following animation is showing printing of a product label combination. We’ve created some sample product labels which you can download and upload to the plugin. If you want to read more information go to WooCommerce DYMO Print documentation. There you’ll find more about debugging, FAQ and extra options.